There is something so inspiring about waking to the sound of seagulls singing their early morning fishing song. Beyond that I can faintly make out the sound of ropes and masts meeting each other as the wind and surf rock the sailboats nearby. It’s a beautiful day, I just know it, before I even open my eyes. Waking in a majestic inn that was born in 1907 also lends itself to optimism. Our plan today is to enjoy this secret gem of a town for a few hours then meander up along the edge of Alabama, then slip into Georgia, landing somewhere outside of Atlanta for the night. After a cup of coffee, that somehow always tastes better on the road, and a shower, we walk the two blocks back to the breezy hotel we considered last night. They reportedly have a fantastic breakfast and we love breakfast. It’s empty. No one, no one, is eating. It’s like 9 am, the optimum vacation breakfast time. As we walk into the empty dining room we’re not even sure we’re in the right place. A waitress appears from a back room, presumably the kitchen. 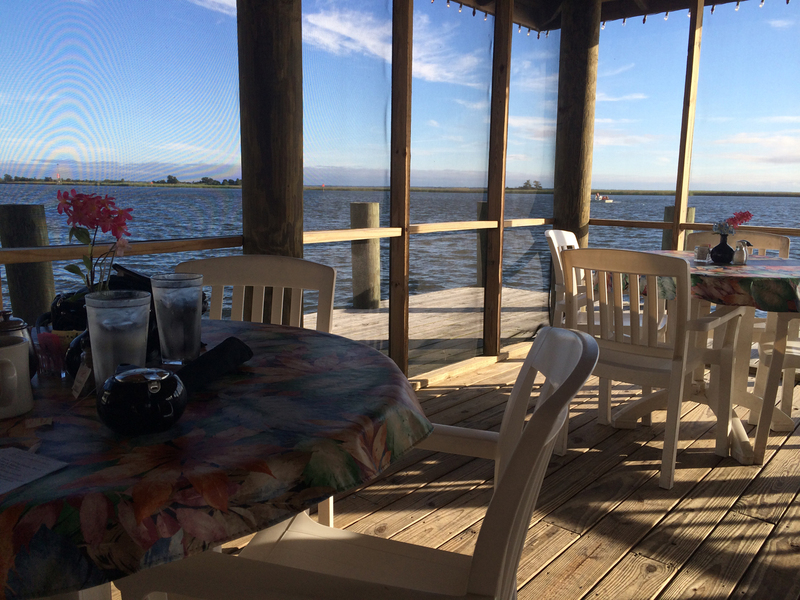 We state our intention to have breakfast, outside, on the water, in the screened room. She looks a little surprised but seats us anyway. Why isn’t everyone here? There were tons of people milling about last night. Did they have that much fun? I imagine a life of beginning and ending my day on water this beautiful and serene. Watching the golden sea grasses sway with the breeze and ripple with the tides. Sitting on my deck inhaling the healing negative ions of the sea. Hearing the water lap against the shore. Witnessing a sky full of stars so bright I can read by them. Would I eventually take it all for granted? My reverie is interrupted by our omelets. We are not disappointed. The food is delicious maybe made more so by our surroundings. Not one person joins us on our private screened dining room. The stores we scouted last night open at 10. We still have some time so we head back to the pier with the two fishing boats for another view of the water. For a small town there’s so much to see, but it would be easy to miss. It’s beauty is in the history, the peeling paint, rusty roofs and boarded windows. It’s in the buildings that look abandoned but are actually bustling with activity. It’s in the newer structures build to fit in with the architecture of the past. This is a solid town. People here don’t lock their doors, they all say hello, they’re grounded here. This is the kind of town where cats are always welcome. Or maybe it is they that allow people. Little pockets of this place remind me of the keys, that easiness, casualness of life. It seems impossible for stress to exist here. The Visitor Center opens before everything else so we find ourselves there speaking with a lovely volunteer named Donna. She shares more to do with us than we can even imagine seeing before we hit the road again, but one place in particular made the list – St. George’s Island. It’s a 15 minute drive away and it’s “the most beautiful beach in Florida.” But first there’s some local shopping to do. The shops provide more local color. At the book store I chat with the proprietor who is from here. I tell her how much we love her fair town and how we’d love to come back to visit soon and stay longer. “Most people just move here,” she says. Hmm. It’s not off the table. Larry and I divide to conquer. I meander toward one of three artistically painted garages. This one is stocked with remainders from other local stores and a few antiques and, appropriately enough, garage sale type items. Everything is tax free and 100% of the proceeds go to a local charity. I poke around hoping to find something I need, but leave empty-handed. There is an old brick building ahead with a courtyard begging me to come explore. 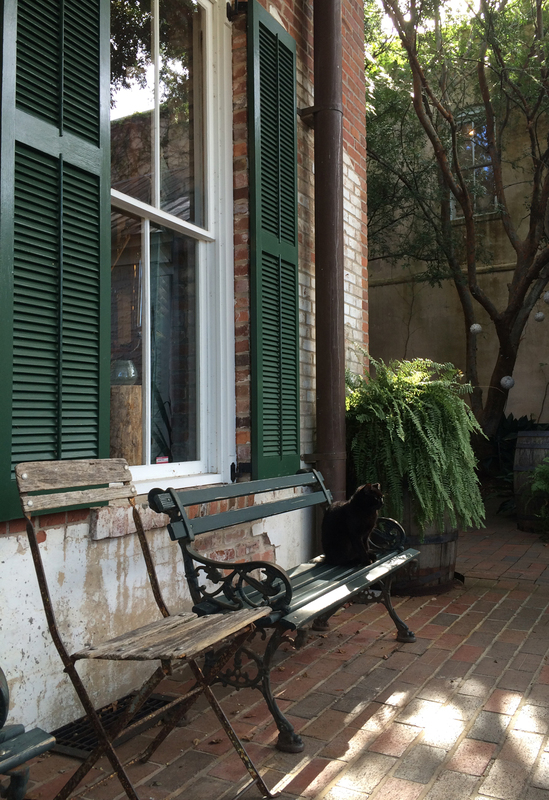 I push open iron gates mounted to solid brick posts with a sign announcing its establishment in 1884, onto a brick patio with benches, tables and chairs, mature shade trees and at least three cats. Two of them consider me with disinterest, the third seems to be afraid of his own shadow. They are guarding a store that carries a little bit of everything. Clothes, gift items, some novelty food stuff, antiques. Its only employee is distracted by a distressing phone call regarding the ineptitude of a family member and the idiocy of another. I wander through the aisles unnoticed. Down the street another book store comes into view. This one is overstaffed. Aside from myself, everyone works here. There are notions in addition to a large selection of mostly children’s books. It’s quaint and made even more inviting by the rocking chairs flanking either side of the front door outside. I sheepishly tell them I am not looking for a book, but rather my husband. He has not been spotted. Just then my phone rings. He’s at the inn loading the car. 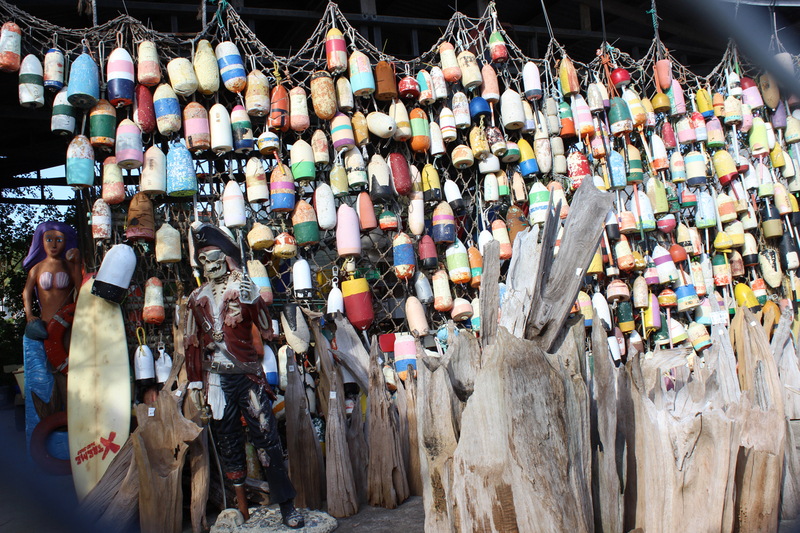 Just down from the water is a preserved wrecked fishing boat, surrounding it, fence and beautiful gardens. The previous bow of the wrecked ship. The Tap Room offers craft beer and delicious pub food. The Gibson Inn. Welcoming and comfortable. The shell of a building, beautiful in its disrepair. This is the kind of town where people crochet coozies for their hanging plants. How can you not love that?! Antiques and liquor. Works for me. It’s hard to leave the warm embrace of our special room, but travel again we must. We check out, promise to be back and venture on to St. George Island. This unassuming island could care less if you know its here or not. It may actually prefer you just drive right past it. Crossing the bridge we are greeted first by the lighthouse. Modest in adornment but stately in that way lighthouses are. We are given two choices: right or left. We go right. We pass a gas station, a realty office and homes. Lots and lots of homes. We spot a beach access walkway and park in front of it. At the other end of the walkway is a beach with the whitest sand I have ever seen, the water is some sort of deep turquoise Crayola has not yet come up with and virtually no one is on the beach. It might just be paradise. Filled with sea air and the inexplicable beauty of nature we drive on. Or back, rather. This is long island with a state park at one end and if we get that far we’ll be lost among the critters all day. It’s best this way, save something for next time. On the way out we catch sight of the controversial cottages. Narrow slivers of homes perched atop the dunes (part of the controversy) and spaced evenly apart. They resemble pickets in a fence. They are mostly seasonal rentals and have a million dollar view of the gulf, but they do appear ‘new’ in their habitat. They are kind of cute though, so I have to take a shot or two. A walk with a view. The unnamable colors of the Gulf of Mexico. We feel the equal tug and pull of staying and exploring and hitting the road to find more treasures. We decide to plan a trip back to stay longer and take our leave. But not before scraping a lineage of love bugs off the front of the car and gassing up. We point ourselves due north. Alabama is our next stop. Okay, our next stop after the pelican hang out. I really like the last photo!!! Thanks! 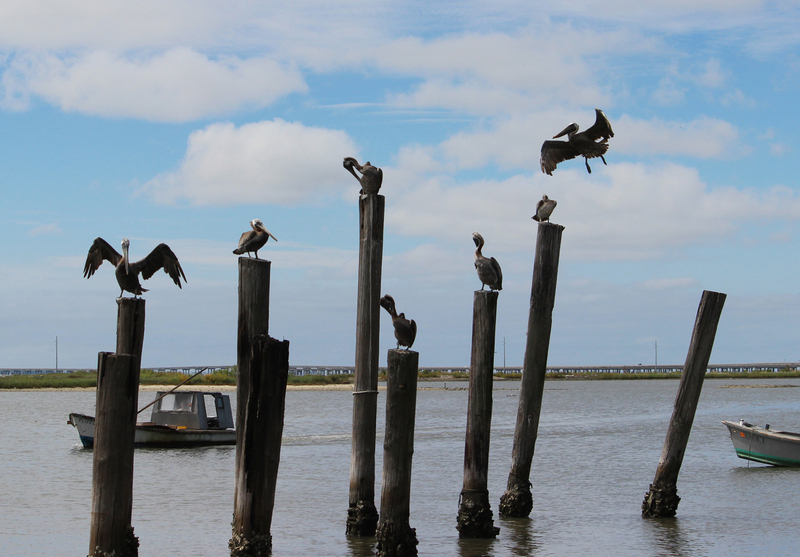 I LOVE pelicans. The sun was not in the best spot, but I couldn’t help myself.